Knowing all the best climbing areas in the world is only half the battle. It’s just as important to know when is the best time to go to all these meccas. Otherwise, you’ll spend more time battling heat or snow than you will battling the rock. Maybe you’re an alpinist and you like that... but you might not see yourself on top of many things. With 27 Crags .premium you can access ALL the topos listed here - starting only 3,90€ month. The normal process is to discover a new area, get psyched, find out you’ve just missed the season and then impatiently wait up to a year to climb there. How about we switch that around? Here, I have whipped together a quick climbing season calendar to let you know where you can climb during which month! Long routes, hard climbing and a magnificent setting. Sounds pretty good to me. Siurana is for those who like a good atmosphere, multiple styles of climbing, and prefer not to climb on pockets. And in case you do, Montsant and Margalef are just a short drive away! No. of Routes - Siurana and Montsant have more than 2300 routes in total. Season details: Best season is autumn to spring. By choosing the right crags climbing all year round possible. 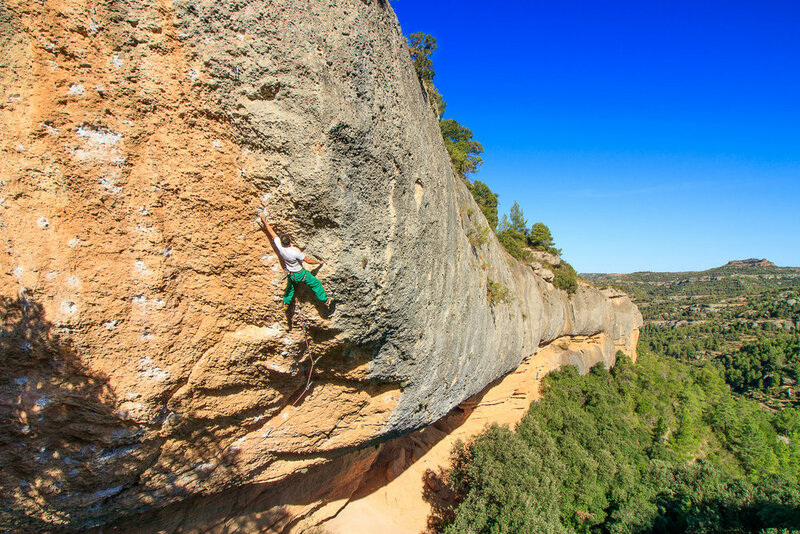 Margalef is one of the areas with the most routes above 8a and where to go if you’re a fan of pockets! Power endurance, bouldery style, the odd tufa. Many people think it’s only hard routes here but there are new areas now with many easy routes. No. of Routes - 1401 sport and more being opened. For Who - Known for having some of the hardest routes in the world, Margalef also has plenty of climbs at the 4, 5 and 6 grades. Season details: Climbing throughout the year is possible, but best months are September, October, March, April and May. The Peak District has one of the richest climbing histories in the world. Largely centred around the city of Sheffield, it turned the city into a hub for anyone who wanted to prove themselves on the British climbing scene. This has meant that the climbing is often tougher than other parts of the world but it’s all the more rewarding! Climbing Style - Gritstone has to be one of the most technical rock types in the world. The limestone however provides a powerful, tension-focused alternative. No. of Routes - Many! Almost every rock imaginable has a line on it in the Peaks. For Who - There is fantastic bouldering, trad climbing and sport to try at all levels! Be aware that the English grades are some of the toughest in the world! Season details - Climbing is possible all year round in the Peaks. Locals will boulder on the gritstone in the winter, boulder on limestone in the warmer months and then trad or sport climb in the summer. Albarracín is on of the most enjoyable places to boulder. Here you will find fantastic roofs, fun dynos and a very relaxed atmosphere. For Who - People climbing between 6a and 7b will have the most to play with. Must enjoy roofs! Season details - The season can stretch all from September to May. Summer might be too warm but it's still possible to climb early/late and in shady valleys. Fontainebleau is where boulderers come to be humbled. Many believe that you can’t truly say you climb at a certain grade until you have climbed it in Fontainebleau. Here you will find beautiful seas of sandstone boulders of the most technical style. It is widely agreed that Fontainebleau has the best bouldering in the world. Climbing Style - Technical! Slopey, powerful climbs but you’ll not get away without good footwork! No. of Routes - 8785 problems currently in the 27 Crags .premium topos and more coming all the time. For Who - Everyone. Climbing in Font is an essential experience for any climber at absolutely any grade. Season details - August-September and April-May the temperatures are normally pleasant but not too hot. During easter Font is packed. Bohuslän is an awesome place to be especially for a trad climber. Even driving through the landscape is an experience but questing up the cracks of those massive walls is truly epic! No. of Routes - 625 including trad + sport. Also a lot of boulders around! For Who - Those psyched for mid range, feel good trad climbs in a stunning location. Season details - Spring or Fall is best for climbing, Summer is also possible. With great rock quality spread throughout the island, Åland is a wonderful place to go for bouldering and an island getaway experience. Season details - June - August is the best time to enjoy this beautiful island. Céüse is somewhere you could go even for the view. On top of this it has amazing, world class rock with every kind of pocket! Season details - Late spring to autumn is when you’ll find the best conditions. Rocklands is the most fun place in the world to boulder. Here you find the unique combination of amazing bouldering, amazing weather and an amazing community all wrapped up into one package. Season details - It’s far too hot here outside of South African winter, which is June-September. The weather is normally pretty stable during this time. Europe’s summer bouldering mecca. One of the few areas where the accommodation and boulders are right beside each other. Magic Wood is a great place to play on overhanging granite alongside the whole climbing community. Season details - The snow melts and climbing is possible from May to November. A superb summer destination. There is a lot of underrated climbing to go at in Norway. With areas like Skien in the south and Lofoten and Vingsand in the north there’s plenty of high quality rock to explore! Climbing Style - The majority of climbing is on overhanging granite, however different crags have different features to work with. For Who - A range of crags with a rage of grades. The sport climbing generally accommodates those climbing 7b and above a bit better. Season details - May - September are the months you’ll find more pleasant conditions. I’m sure you’ve seen some amazing photos of sport climbing on crazy arches - that’s Rodellar! Climbing Style - Long, steep, blocky, tufa action! Season details - Spring and Autumn are the seasons you’ll find the best temperatures. Many believe the condition of the rock is better in Autumn as there won’t be any winter run-off. A part of Sardinia with many fantastic limestone crags to play on. Known for its longer, power endurance routes, Ogliastra is an area where you can definitely get your daily tufa climb in. For Who - Those looking for some amazing climbing with amazing views in the 6 range. Season details - Climbing all year round is possible if you visit the high crags in summer and the low crags in winter. Omis is a stunning town in Croatia surround by fantastic limestone cliffs. When I say surrounded, I mean some of the crags are only a 5 minute walk in! That way you can make the most of the excellent climbing and the great Croatian food! Once there, check out also Drašnice crag which is close by. Climbing Style - Great quality limestone at every angle! Season details - You can climb all year round, but the best time is spring and autumn. Although it is hot in summer, many sectors are in the shade so you can climb part of the day. Winter is good, except when the strong northern Bora wind blows. One of the younger areas on this list. Alcañiz has a lot more room to grow and I wouldn’t be surprised if it becomes one of the main bouldering areas in Spain. Climbing Style - Sandstone roofs and overhangs with crimps and slopey topouts. More versatile when compared to Albarracín. No. of Routes - 1636 and potential for hundreds more! Season details - September to May is best. Kalymnos is growing a reputation of being one of the best sport climbing destinations in the world. This quaint island has become one of the biggest social hubs for climber of all levels. No. of Routes - 3354 routes currently and the amount if constantly growing! For Who - Again, there is so much to go at, both beginners and the advanced will feel right at home here. Season details - Climbing is possible almost all year except for the summer months. October is the busiest month but many people go to Kalymnos for their Christmas holidays. In short time Leonidio has established its place as one of the most exciting new sport climbing areas. This place offers hundreds of routes to choose from, and plenty of new ones are being opened every year. Climbing Style - Tufas, technical routes and crimps for the slab masters! Everything you could want! For Who - So many crags with so many routes. There's something for absolutely everyone! Season details - Between October and April is the best time to check out the climbing in Greece. Athens boasts some of the best tufa climbing in the world but for a truly unique experience, you must check out the marble crags! Athens not only has a wide variety of sport climbing but also sports bouldering, multi-pitch and deep water soloing potential! Climbing Style - All kinds of limestone at all kinds of angles and let’s not forget the 2000+ year old man-made marble quarries where the style gets truly unique! No. of Routes - 976 currently on .premium more updated constantly. For Who - Again, anyone and everyone will find something for themselves here! Lagada. Photo by Georgios Chaziris. All though these are the main areas, there are still many more walls of impeccable limestone scattered around mainland Greece. Using the 27 Crags .premium topos, you can visit the world class areas of Sparta, Sofia and more! 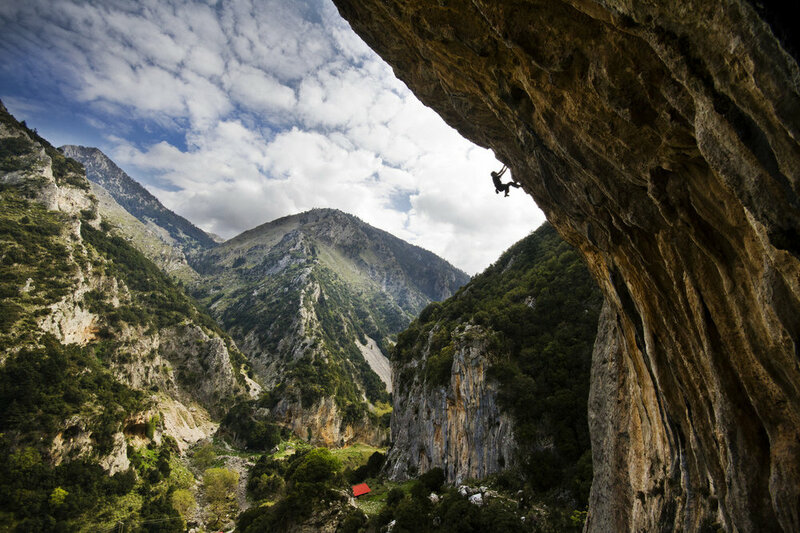 The mainland Greece with all its crags is a perfect destination for a climbing road trip. Climbing Style - Tufas, pockets and more on some fantastic limestone! Too many styles to count here! No. of Routes - 755 and growing! For Who - I’m sure you get the picture. There’s so much here, you’ll definitely find the route for you. Sign up for free here and get 7 days free access to 400+ .premium topos!